In his 2001 book The Future of Success, Robert Reich devotes most of a chapter to reasons why work is taking over our lives. If our financial fortunes have declined, we may have to choose between working longer hours and reducing our standard of living. Or, if we are prized, highly paid workers, the financial rewards for working more are higher than they ever been. In the meantime, for all workers, the sense of certainty about future income is less than it was a generation ago. If you have a job now, you might not have one at the end of the year. Or, if you have highly marketable skills, those skills might fade or become less important or less distinctive in just a few years. You have to make money while you can. Even if you are making plenty of money, you might have to maintain a fast pace of work just to keep your career on the fast track or keep up with your field. At the same time, communication devices and channels make it easy for work to spill out of its usual place and time slot. Phone calls and e-mail go with you, if you choose, and you might very well choose to stay connected in order to not miss a chance to do some work, knowing how uncertain the future is. It doesn’t mean very much if I say that, but this is a CNBC writer saying it: “Death of the ‘McMansion’: Era of Huge Homes Is Over.” CNBC was right at the heart of the culture of financial excess that gave rise to so many oversized, poorly designed, often poorly constructed houses all over the United States and elsewhere, so when they say that trend is over, it means something. 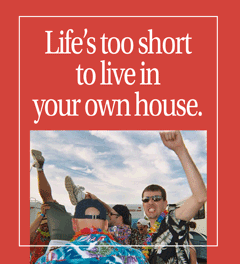 “Life’s too short to clean your own house,” was the headline on the brochure I got in the mail. In the parody you see to the left, I took this idea to the logical next step. You see, there is a grain of truth in the original advertisement. If you can’t clean your house, it isn’t because cleaning is such hard work. It’s because you don’t have time. What this really means is that you’re not spending much time in the rooms of your house. Maybe you’re there, but you’re not really there — you’re on the phone, watching TV, checking on what your friends are doing online, or whatever, but too busy to really experience the room you’re in.